Congratulations to all medalists and thanks for coming to the 2018 race. keeping our great sport kicking. We hope you had a good workout and we'll see you next year on the trails. 8 in the Rough steps in to Sprague Brook Park on Sunday, September 9th 2018 for another wham-bam day of trail racing. New for this year we will be using shelter #5 just past the casino building. Race-day # pickup and registration from 8am. Race starts at 10am. Free kids race weaither permitting around noon. Plenty of parking and picnic athmosphere. 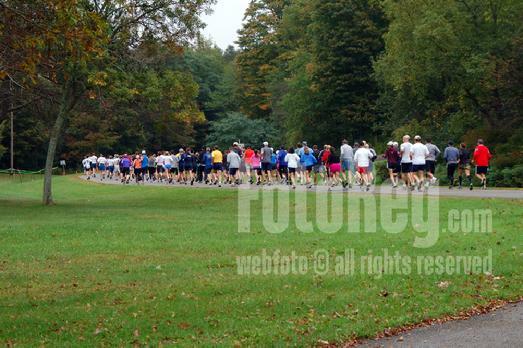 Racers have a mass start on the Park's main roadway near shelter #5 and proceed on one of the most challenging and exciting courses in the southtowns. Single track like few other venues and mostly canopy-cover means deep woods trail running action. Courses feature a gentle start that rolls into several miles of gnarly, hard-core single track. Two water stops on the course fuel runners for one of the seasons most demanding days in the woods. Expect tight, twisty single-track, ascents and descents with mostly tree covered sections deep in Park trails. Creek crossings (typically low late in the season) and the infamous Skunk Ridge climb to the finishing stretch. 8 in the Rough is part of the Eastern Grip Series. Looking for a bit tamer route check out this year's brand new 4 in the Rough. Shorter with less pressure but equally as fun for those looking for great fun in the woods. 4 in the rough turns off quickly and doubles back using the final chapter of the long course. A terrific taste of some great single track trails and the infamous finish. Awards to top 15 finishers M/F for this shorter version. Pre-register to get the early rates or come on down on race-day to enter. Race-day registration is always welcome. T-shirts to the first 150 and as they last on race-day. Post-race lunch, door prizes, kids races and awards ceremony. Registration opens at 8:00am at the Sprague Brook Park casino. 10am race starts. Noon kids race & awards ceremony or after our final finisher in the long race. Sprague Brook Park offers tent and trailer camping areas. Race-day registration is welcome-come on down! We'll see you at the starting line.